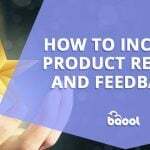 To make an excellent sales performance of any product, an in-depth analysis of the product must be conducted. This involves analyzing a product in all aspects to understand it much deeper. The product analysis report below from Leelinesourcing will offer you a detailed analysis of the market situation of party balloons from various aspects. You can refer to it when purchasing and selling party balloons. According to data from Google trends (trends.google.com), the search for party balloons in the United States over the past five years experiences little fluctuation with an upward trend year after year. 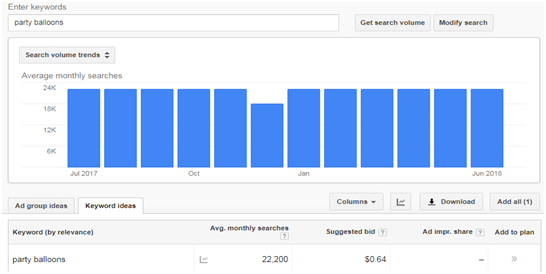 The best searched month is usually in December. From a global view, the overall trend of the search popularity of party balloons in the past five years remains relatively stable. There have been no significant fluctuations. However, it can be clearly seen from the figure that most of the search nadir of the party balloons is in December. Besides Google trend, we also looked at the search data for party balloons in the United States from Amazon by using the Keywords tool. According to the data, the average search of party balloons is 197,000 a month on Amazon in the last one year. The fewest searches are in December 2017 with 132,000 searches. Through the above data, we can conclude that: Demand for party balloons is stable, with less demand coming in December on Amazon and Google. 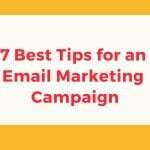 A clear understanding of the market distribution of products is important for proper marketing. 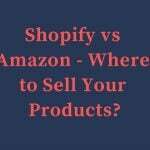 With a clear understanding of the market distribution, you will know where to sell your products and make better sales. 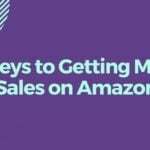 A study on market distribution is imperative when selling any product. The global regional search results of Google trends showed the highest popularity of party balloons in Australia, followed by the Philippines and the United States. According to the chart, the popularity of party balloon searches in Australia has been quite stable in the past 12 months with an average search of over 75. We can conclude that the party balloon market in Australia is relatively large. In particular, South Australia has the biggest demand for party balloons, followed by Victoria. 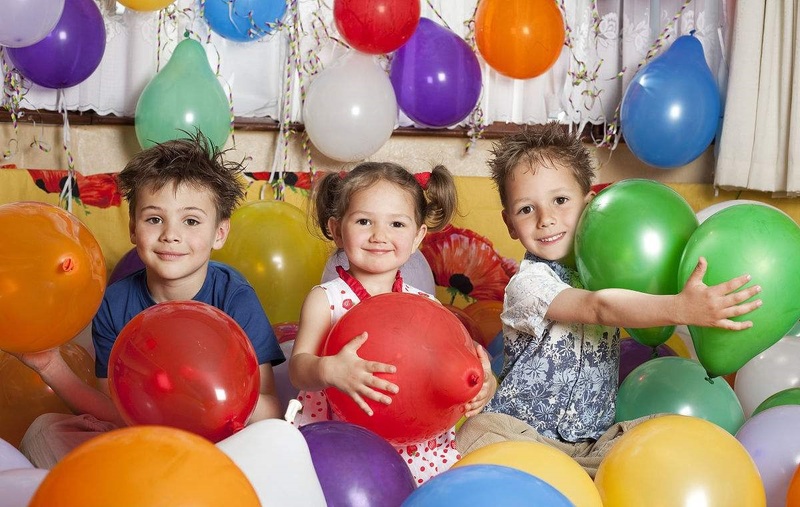 Leelinesourcing recommends that you also consider selling party balloons in Australia and the United States. In the current market environment, fierce competition between enterprises and industries is inevitable. In order to understand the sales situation of party balloons better, we need to do some research on the market competition. Using Google Adwords (adwords.google.com) and the Keyword tool (keywordtool.io) to search Party balloons, we found that the average number of Party balloons search on Google was 22, 200 a month. On the other hand, the average number of Party balloons search on Amazon was 197,000 a month. The CPC was 0.99 dollars per click with a competition value of 1(According to the Keywords tool table, products with a competitive value of 0.69-1 are highly competitive products). Overall, the market competition for party balloons is fierce both on independent sales websites and on Amazon. When selling a product, the focus should not just be on the profits, but also on every aspect of the procurement costs. As shown in the picture, our search for party balloons on the 1688 website revealed that most of the party balloons were in the low price range of $0.1 to $4.5. Besides, balloons are small in size, lightweight and require simple packaging. The cost of packaging and transporting party balloons is quite low. Overall, the procurement costs of party balloons are low. A product suitable for sale must have not only low purchase costs but also have considerable sales profits. After understanding the low purchase costs of party balloons, let’s see if the profit margins are big enough. First, we randomly selected a set of party balloons from Alibaba for $2.16. 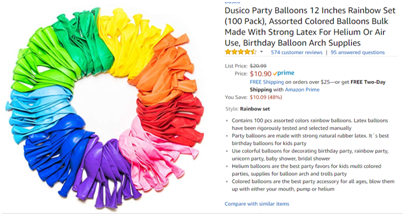 The same set of balloons sold for $10.9 in Amazon. We then did a simple math of subtracting the cost of the product from the selling price as shown below. 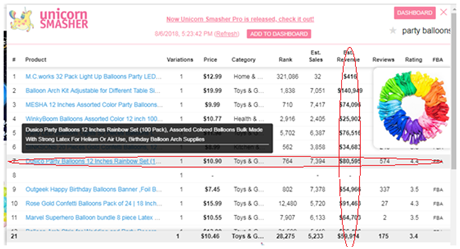 We then used the Unicorn smasherg tool to see the average monthly sales of this product which we found to be about 7394. So basically this gives us monthly returns of 8.74*7394=67623.56 dollars. Therefore, profits of party balloons are quite good even after deducting the transportation and packaging costs. In addition, the sales of party balloons in most stores were relatively stable. This shows that party balloons are in high demand and have high profits. Price stability indicates a stable sales market. However, a stable market environment indirectly affects the sales of products. 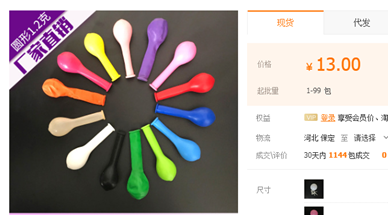 Therefore, price fluctuation of party balloons is also an important part of the product analysis. The figure above shows the one-year historical sales price of this party balloon product from the keepa tool. As shown in the picture, the price of the party balloon has fluctuated a lot in the past one year with the highest price at $28.99 and the lowest at $7.98. This shows that the market environment of party balloons is not stable, and the prices and profits vary according to the market environment. (1) The market demand for party balloons is relatively large and stable. (2) The main sales markets are in Australia and the United States. (3) The procurement cost of party balloons is low, and the profit space is large. (4)However, the price fluctuates greatly making the sales market unstable. (5)The market competition is fierce. Products with low costs and high profits are usually accompanied by certain market risks. 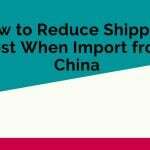 Therefore, if you want to reduce the market risk, the first thing you must do is find a reliable supplier to provide you with high-quality goods at the lowest prices. 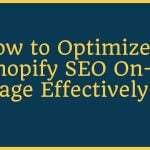 This helps you reduce the purchase costs and other risks that might come along the way. 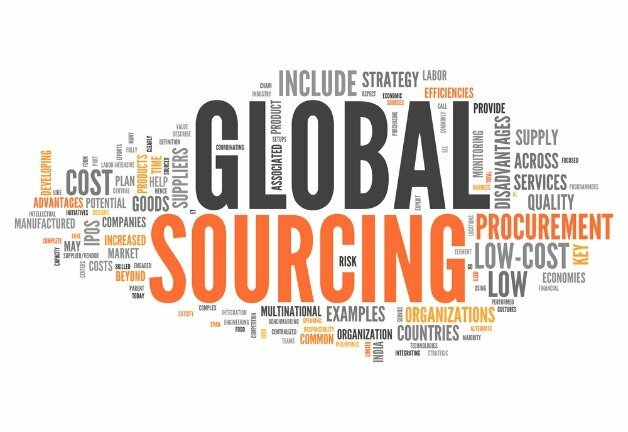 This is where Leelinesourcing comes in to help you with all your sourcing needs. We are a perfect fit when it comes to sourcing products from China. We have high-quality supplier resources, professional purchasers, and salesmen to help you along the way. 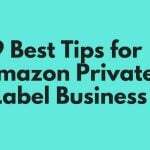 Our services include but are not limited to: finding suppliers, conducting credit verification, cross-price inspection, negotiating prices, product photography, labeling, FBA transportation and product branding. All of these services are convenient and helpful when purchasing goods in China. Contact us through our email address: [email protected]. 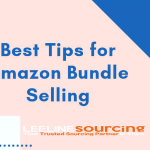 You can also learn more about us and consult us through our website: https://leelinesourcing.com/. 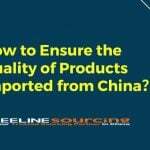 This is Leelinesourcing product analysis report. It is our hope it was helpful in your party balloon business ventures. Feel free to contact us should you face any issue along the way.